Betraying Masters- In episode 99 Ha-ha and Kwang Soo were teamed up as spies, leading to this nickname that describes both cast members tendency to betray those around them. Ddakji King- Ddakji is a Korean game that involves an intricately folded paper square (ddakji). The goal is to flip over the other persons Ddakji. This game has been featured many times in RM history. Jae Suk has often claimed the title of Ddakji King; however as of more recent episodes his skills have lost out to those of KJK and Gary. 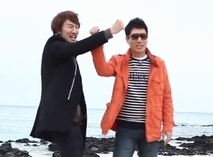 Easy Brothers– The teaming of Kwang Soo and Juk Sin, aka the Easy Brothers, was born in episode 68 when the two teamed up as spies. Combining elements of both individuals’ names, the clue to their spy identities was Easy. Hence the legendary Easy Brothers were born. Viewed as a weak pairing they have moments when they surprise everyone around them-with a semblance of competency. Eun Hye, The Commander’s Achilles Heel– Eun Hye is name dropped left and right to refer to KJK’s time as a CM on the show X-Man. Kookie’s time on the show was partially spent in a much publicized love line with the actress Eun Hye. 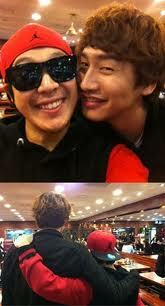 KJK is often teased about his relationship, pretend or otherwise, by Ha-ha and Kwang Soo (much to KJK’s annoyance). 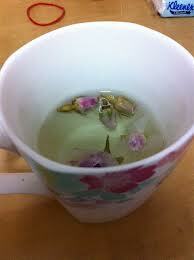 Flower Tea– In episode 56 the girl group guests were mysteriously transformed into a hilarious group of older female comedians and actresses through drinking flower tea. The Running Man cast will often bring up Flower Tea when they fear another unfortunate transformation. Gary’s Departure– A more recent reference, Gary announced he was leaving Running Man in September 2012 due to the fallout from the Super 7 concert. The concert was organized by Leessang Company (operated by Gary and Gil of the hip hop duo Leessang) and was set to feature the members of the variety program Infinite Challenge. Due to fallout about high ticket prices the concert was cancelled and both members of Leessang announced that they would no longer appear on variety shows. Luckily Gary came to his senses and returned to RM, however his announced departure has led to many recent gags about “missing Gary”. Grasshopper Hunting– Episode 52 marked the first time actor Choi Mon Soo guested on RM. During his stint as guest he was betrayed by Jae Suk (nonetheless after forming an alliance with him). After the back stab he vowed to gain revenge on Jae Suk and go “grasshopper hunting”. Fast forward to episodes 69 and 118 and you will find the RM cast targeted by the uber frightening Mon Soo. Whenever the RM want to bring up the worst of the worst possibility of a guest they mention Mon Soo. Jail Regulars– In the early days Suk Jin, Kwang Soo, and Jae Suk were often the first eliminated, leading to their union as Jail regulars. 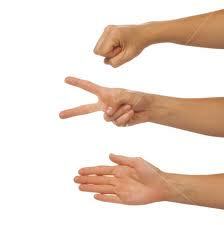 Kai Bai Boh– The Korean term for rock, paper, scissors. 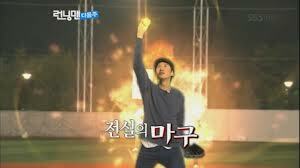 Played a multitude of times during Running Man, Suk Jin often claims to be the master of the game. Kim Jong Kook and the two kids– Early in Running Man’s history Jong Kook was the leader of his own team (Jae Suk would lead the other). Gary and Ha-ha were almost always on Kookie’s team and before long his domineering attitude left the two younger men to act as “the kids”. Monday Couple– The main love line of Running Man, Gary was the first to admit that he liked Song Ji Hyo (when Jae Suk asked Song Ji Hyo what she was good at Gary answered “Love”. When the rest of the cast confronted him he managed to stutter that he meant she had lovely eyes). Adorable and with great chemistry this pairing took a hiatus once it was revealed that Ji Hyo had a real life boyfriend. In recent episodes the Monday Couple seem to be making a return (fist-pumps and awws). The term Monday couple refers to the fact that Running Man usually films on a Monday, leading both Gary and Ji Hyo to claim that their “relationship” was only in affect on Mondays. My Hyung, My Dongsaeng – Along with the Jong Kook and the two kids dynamic, the relationship between Kim Jong Kook and Ha-Ha (both having starred in other variety programs together) is often played comically when Ha-ha and his Hyung showed their affection through their big brother little brother teaming. Pil! Chok! 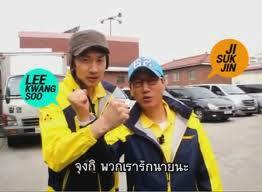 Cross!– The war cry of the Easy Brothers, Kwang Soo and Suk Jin, it translates to Feel, Hunch, Cross. Or as I like to think of it – we know we are weak but we are freaking awesome! 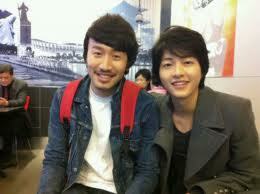 Same Aged Friends– While Song Joong Ki was a Running Man member he was often claimed as a dear friend by Kwang Soo, both of them born in the same year. Joong Ki often denied their friendship for comedic affect however in his final episode he tearfully admitted that Kwang Soo was the friend that was always there to listen. Awwwww. Song Song Siblings– The teaming of Song Ji Hyo and Song Joong Ki. Initially there was the semblance of a possible love line between the two however it developed into a satisfying sibling-like relationship. Stresssss– Gary’s catchphrase, often involving a pull to the hair and an absolutely un-peaceful look on Gary’s face. Super Power References– As of this post the Running Man team has played with super powers 3 times, during episodes 87, 96, and 119. As the premise goes-each running man cast member drinks a super power potion, imbuing them with “powers” that range from calling on a team of mime-like distractions (often referred to as lolols), stopping time, or flying over a soccer field. The powers are activated by the cast member shouting out a silly phrase such as “Controller of time and space”. Water Gun Mastery– Water guns have made multiple appearances in the history Running Man. The shoot-em-up game usually involves members eliminating each other by drenching cast members name tags with a variety of water pistols. Jae Suk , thanks to a past mission to eliminate each member without their knowledge, often claims the title of Master of the Water Gun. It was the best research I have ever completed :). After a nasty cold I spent a lot of time catching up on old RM episodes- to the point that I am starting to dread the fact the list of unseen episodes is dwindling quickly.